Straight from the waist, with a wide lapel from another fabric. 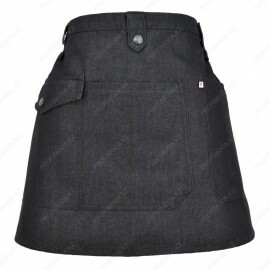 Fabric grease-water-repellent..
Classic, straight cut at the waist, 85cm. Fabric grease-water-repellent..
A straight cut model with a lapel and two rubberized pockets. 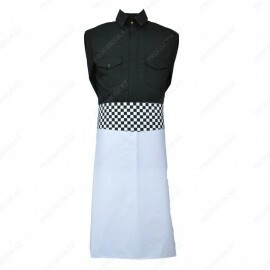 Fabric grease-water-repellent..
Barman's apron with leather pockets on the straps..
Model with a bib, elongated model. Straps connecting at the neck in petto..